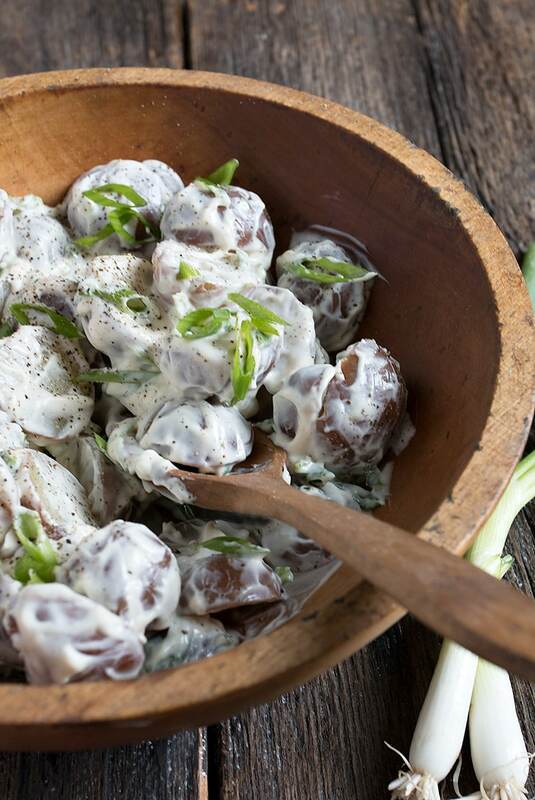 This red potato salad uses mini red potatoes, tossed in a creamy sour cream, mayonnaise and mustard dressing, together with lots of diced green onion. This Red Potato Salad is another Summer essential salad here. 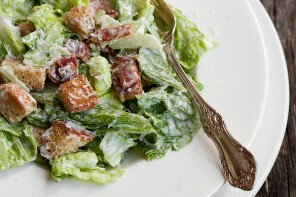 I love the simplicity of it and the tang of the sour cream in the dressing. 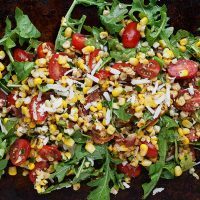 This salad can be made well ahead. The red potatoes hold up really well and keep their lovely texture, while the generous sauce keeps them moist. And speaking of the generous sauce, I know it looks like a lot, but trust me, because of the large pieces of potato, it’s really just right. A perfect balance of potato and sauce. If you have chives on hand or in the garden, feel free to substitute chives for the green onion. When buying your mini red potatoes, it’s best to select potatoes of similar size, so they cook at the same rate and are nicer in the salad. If your only choice is larger mini red potatoes, you may want to quarter them rather than halve them. Be sure to watch your potatoes closely as they near done and cook only until tender. If you happen to have a bit of bacon around, a bit of finely diced cooked bacon would be a nice addition to change this up. Be sure to generously salt both your boiling water and your finished salad to really bring out the flavours. 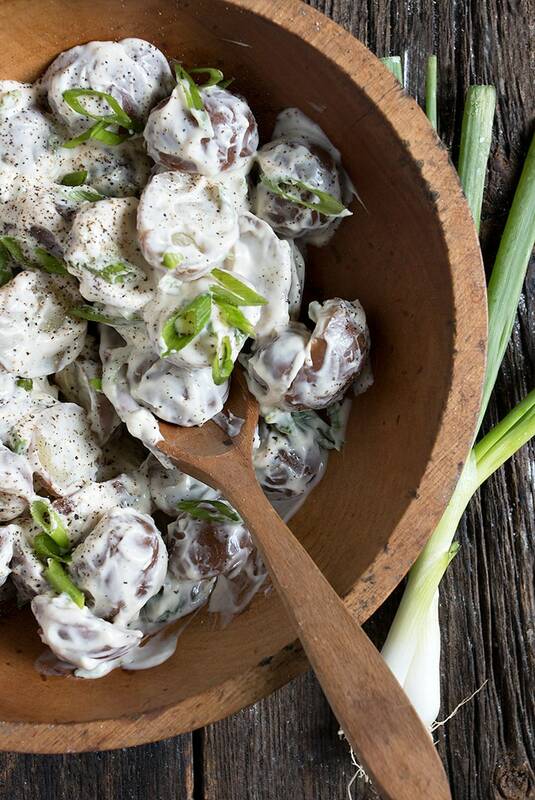 Lovely, red potatoes tossed in a creamy sour cream and green onion dressing. A great addition to your Summer table or BBQ. Place whole mini potatoes in a large pot of cold, salted water. Bring to a boil over high heat and cook for 15-20 minutes, or until just tender. Drain and let stand 10 minutes or until cool enough to handle. Cut in half and place in a large bowl. Drizzle the vinegar over the potatoes and toss lightly. Sprinkle with a little salt. Prepare the dressing by combining all the dressing ingredients in a medium bowl and stirring until smooth. Pour over potatoes and stir to combine. Season with additional salt and freshly ground pepper, to taste (be sure to salt generously to really bring out the flavours). Cover and refrigerate until well cooled, at least 2 hours. Garnish with additional green onion to serve. Potato salad is one of those summer staples that is just dangerous around me. Not to mention, I absolutely love sour cream. So you better believe I could devour this creamy deliciousness like nobodies business! It looks absolutely amazing, Jennifer!! 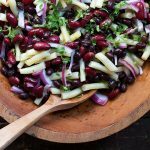 Such a summer classic, this is a must make for bbq season! 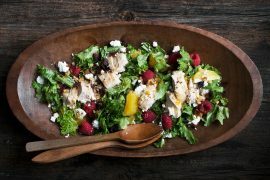 Oh man this looks decadently delicious ~ and I agree with you about the abundant dressing, that just MAKES a potato salad! This is totally my kind of salad recipe. Perfect for summer, looks so delicious and simply perfect with all those green onions! At summer picnics and bbqs potato salad is always what I first gravitate to. This looks so good Jennifer! 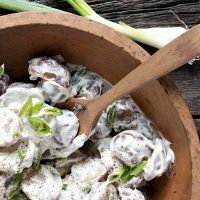 I love how creamy this potato salad looks. I know there’s mayo in it but it looks so much lighter and creamier than a mayonnaise-based potato salad. So perfect for all these summer events coming up! Thanks Chris and yes, even with the mayo, it is a a lighter sauce, for sure! 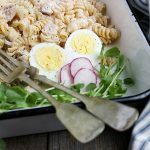 I love a good potato salad and this one fits the bill in so many ways! PS. Recently made your creme fresh with buttermilk and love it! I am always looking for new potato salad recipes, yours looks great. 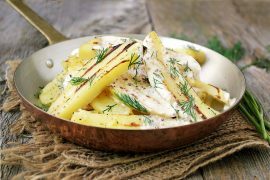 Sour cream is perfect for boiled potatoes. The tang of that sour cream sounds wonderful! Nothing like a good potato salad! Haven’t made my first of the season yet! This looks like the winner! I’ve been craving this very thing! 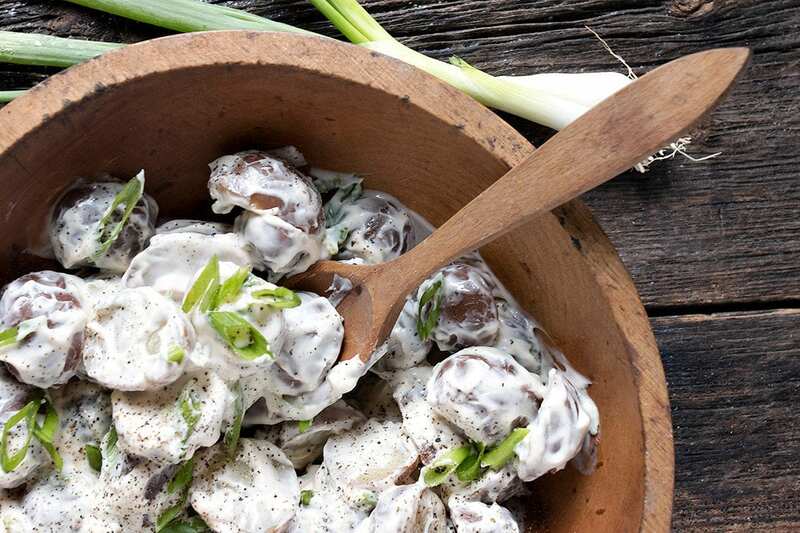 Potatoes and sour cream – what’s not to love? Great idea to use the mini-potatoes – little bites of heaven I’m sure. Pinned!